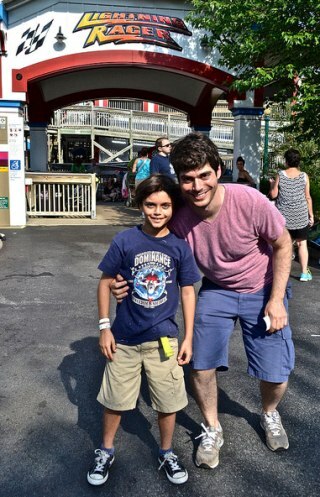 The only way I found to make my boys psyched and excited about traveling with me to Pennsylvania was the promise to take them for a whole day to Hersheypark Amusement Park. In my house the words “amusement park or theme park” are commonly used when I try to get my boys in on the excitement of a trip. It never fails and it worked like a charm for this one as well. I make it my mission to never visit amusement parks on weekends or high season. But for some reason it happened that we could only visit HersheyPark during one of its busiest weekend days. It was beyond even my wildest imagination for what busy could be. 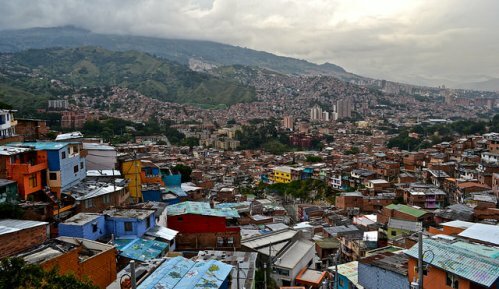 But I also know that if you are aware of the ins and outs, you can avoid a lot of the discomfort. 1. If you get to Hershey the night before, you can go to the park at 6pm to get the tickets for the next day. I wasn’t aware that this was possible until the next day when we arrived in the morning. 2. 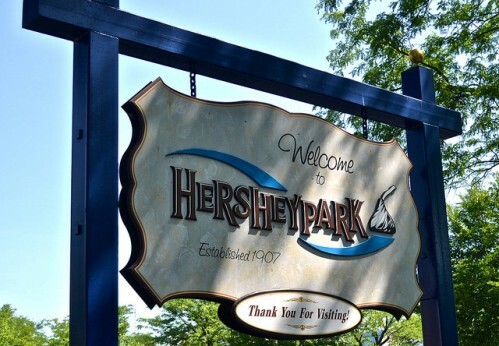 Download the app – Hershey Park came up with an app that works as a map. It has all of the rides on it. However, its best feature is that it shows you an estimate of the wait times for the rides. They also offer free wifi all over the park. This made a huge difference for us! 3. Fast Track Pass – This one can get pretty expensive. It’s $50 per pass per person. However, you get fast access to nine of the best roller-coasters in the park. This, on a day like the one we were at the park, was essential. There were wait lines from 1.5 hours to 2 hours. For me it was worth the price, because my boys, brother and his girlfriend are all roller-coaster junkies. I can’t tell you how much time we saved. How-to use the Fast Track Pass – the reason why most people don’t know about them is because they can’t be bought online or at the admission desk. You have to go to guest services which is inside the park. Also they have a limited amount per day, so my advice is to get there early, even better if you do the 6 pm arrival the night before. The coolest part is that it is not a personal ticket. Anyone can use it. It’s not only for the person who purchased them. Also, keep in mind that they have a set schedule for when people with this pass can go to each roller-coaster. You can’t go before your scheduled time. Another important aspect of the fast track pass is that you can’t go on the same coaster two times in the same day. The most you will have to wait with one of these passes is seven minutes. If you want to get these for kids it is a good idea to make sure that they are tall enough to do most of the roller-coasters before you buy it. It would be a shame to pay all that money for them and then not being able to use it. So I bet you’re wondering: what if I have little kids? Are the fast track passes useless with them? I was traveling with a four year old and that’s exactly what I was thinking. It wasn’t easy and we learned the hard way, but we did learn quickly. Here’s how you do it: As soon as people arrive and the park opens, everyone is following along with the map. Everyone is going to start at the beginning. We did the same and at the first ride we waited around thirty minutes. It was horrible! So, I got the idea to go all the way to the back of the park and start from there. Once we did that it was amazing. The lines for his height category were super fast (to my surprise there were tons of rides for him). They even have two roller-coasters that are for four year olds. No joke! – It was founded in 1903. – The original park was a nature park. – People began visiting the grounds of the future park in 1904 and 1905, while the park’s first pavilion was built in the fall of 1905. – The park formally opened on May 30, 1906 as Hershey Park. – A carousel and a trolley were the park’s first rides. They were added in 1908. – The park slowly added small rides until 1923, when the first roller coaster, Wild Cat, was built. 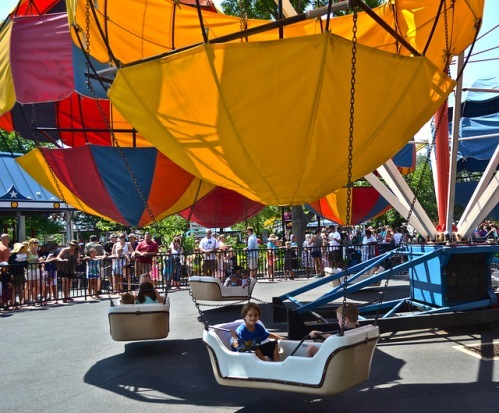 – A small Ferris wheel and the Airplane Swing were the first two kiddie rides added. It happened in 1926. – In 1943, Hershey Park remained closed for almost the entire season due to the gas shortages related to the war. – The park was redeveloped into Hershey Park in 1970, with that cam an expansion of 110 acres. – The park was gated in 1971, and a one-price admission plan was started. – After the addition of Sooper Dooper Looper in 1977, the growth of the park began to slow down. – The year 2000 brought the biggest roller coaster of Midway America – Lightning Racer. – In 2007, Hershey Park celebrated its 100th anniversary. – On August 2, 2011, Hershey Park announced their 12th roller coaster, Skyrush opening May 2012. SUNSET ADMISSION – Save on admission when you come later in the day. View Sunset hours. 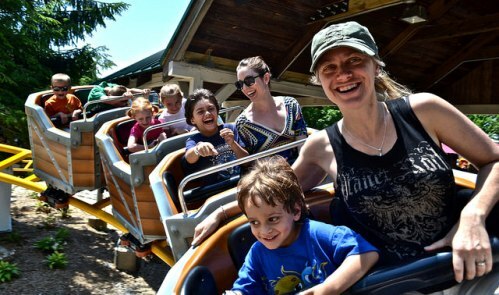 COMBO TICKET WITH DUTCH WONDERLAND – Make your summer twice as nice by visiting Hersheypark and nearby Dutch Wonderland for one great combo price!